God loves you so much, that he sent his only Son to die for your sins and give you an eternity in heaven. But if you refuse to accept this free and gracious gift, he’s going to throw you into a lake of fire where you will burn for eternity. Dang. That makes Jabba the Hutt’s thousand-year Sarlacc digestion program sound like a weekend trip to Disney World. Hell is problematic. There’s no way around it. We can use it to scare people into conversion, or at least give them a stern warning. Or we can try to avoid it, or soften it, or offer hope beyond it. But in any case, one can understand why some people might put finger quotes around the word “gospel” when they try to justify a loving God forcing an eternity of suffering on those who reject him. If you listen carefully, some sermons about Hell can be downright laughable. I’ve heard preachers warn their congregations to turn from sin or go to a place of absolute darkness with a fire that never goes out. Wait, what kind of fire is that? And, is it a lake of fire or just a big room or a cave? I thought Hell was a bottomless pit. Maybe the lake has no bottom and you just sink in liquid fire forever. Ouch. And another thing, how do disembodied people even feel fire? Do spirits burn? Should I attack the devil with a flamethrower? I believe that most of our confusion stems from a general misunderstanding of Scripture. The King James took every biblical reference to a negative afterlife and called it “Hell,” but not all Hell’s are created equal. If you told any of the Bible writers that the earth was round, spinning in space, orbiting around the sun, they would have told you to take a long hike off a short pyramid. 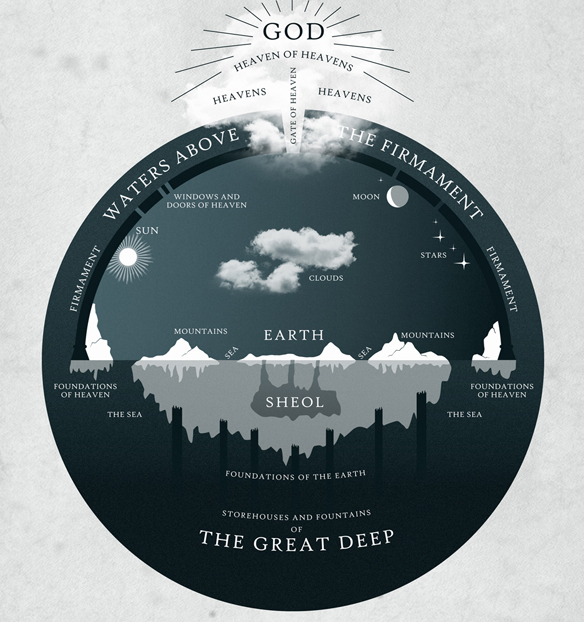 Everyone knows that the universe exists in three tiers: 1) the heavens, where the gods dwell above a watery firmament, 2) the earth, where men serve the gods on a flat surface above a subterranean sea, and 3) the underworld, the dark and silent home of the dead. Duh. All of the Mesopotamian and Canaan epics present the same worldview. So does the Egyptian Book of the Dead. So does the Bible. It was just as simple and obvious to them as a round, rotating world is to us today. No one in the ancient world would ask why the sky is blue. It’s water, stupid. Why do you think the author of Job talks about the water jars of heaven, or the storehouses of snow and hail, or of God laying the foundations of the earth with its bases and cornerstones, or of the recesses of the deep and the gates of death? Israel called their underworld, Sheol (Hades, in Greek). In Psalm 88, Ethan the Ezrahite describes it as a place of utter darkness, where the dead are cut off from the presence of God, severed from his love and faithfulness. In fact, the author of this Psalm claims to be one of God’s own people, yet he begs to remain alive so he is not cut off from God’s presence. David, however, takes a different approach. He claims that God would not abandon the righteous to Sheol (Ps 16), but would redeem them from the pit (Ps 103). Judging by the tone of these Psalms, David is making statements about the afterlife based on God’s character, claiming that God is too good and just to abandon his chosen people to the same fate as the pagans. The Greeks of the first century were still hazy about the afterlife, debating if life simply ended, or if it continued in some vague way in an underworld. A parable of Jesus gives some insight into the Jewish evolution of thought, one that could justify the sentiments of both Ethan and David. In the parable, a wicked rich man and a suffering poor man go to Hades. There, the poor man finds himself in a place of comfort and reward with the saints of God, while the rich man finds himself in a place of agony and flame. They are both in an underworld, but there is a gulf between them. Is Jesus lying about the afterlife? Or is he just teaching the people about the implications of our present existence using the worldview of his listeners? There is something you need to know about Gehenna. In Greek, it means the Valley of Hinnom, a valley right outside Jerusalem. In other words, if Jesus told people to go to Hell, they could just turn around and walk there. The Jews would know immediately what Jesus meant when he talked about Gehenna. It was a cursed place, the valley where the evil kings of Judah would sacrifice their children to Molech, a pagan god, making them walk through fire. Early Christian commentaries reported that, by the first century, the valley had become a garbage dump where the dead bodies of criminals and the carcasses of animals were burned. The fire never went out. Hell is a spiritual “place,” perhaps a state of existence. Just as Jesus compares himself to a vine or bread or a shepherd, he compares the destiny of the wicked to a fiery garbage dump. It is not a literal place of fire, but we can understand the sentiment behind it. This sentiment goes right along with his statement about unsalty salt being thrown onto the street, or unfruitful branches being removed from a vine and burned. Both of these things are useless, therefore they are cast aside. They are garbage. God wants his people to amount to something, to be useful. Not just saved. I’m not saying that if people don’t glow with righteousness they are going to Hell. But I am saying that a clear understanding of the biblical teaching of Hell should give us a healthy encouragement to be useful to him. What do you think? Am I over-spiritualizing this one? Or should we pull out our shovels and start searching for Hell? This entry was posted in Christianity, theology and tagged eternal damnation, Hades, hell, Judgment, Sheol. Bookmark the permalink. That’s a real challenge, especially now that the Gospel is often packaged and presented as more of a judicial transaction than a progressive marital relationship. Both are biblical and important, but both come with implications. What quality of marriage would that person have? What motivation to develop that relationship, or explore the true benefits of sharing life and intimacy? The transaction (ticket to heaven) mentality can strip the spiritual life of all its benefits, and even endanger the life itself. Er . . . ERASE HIS NAME?? Should I mention the whole “spitting the lukewarm believers out of my mouth” scene from verse 16? I like the idea of hell being more of a natural consequence (You acted like useless garbage, therefore you will be treated like useless garbage.) as opposed to a punishment for breaking the rules. I think it frames God as being less malicious and more sensible. I absolutely agree. That’s the biblical sentiment. The question becomes: What does God want people to look and act like? What is this elusive “mark” that we can’t seem to hit? Being unloved and unloving. Being rejected. These appear to be the spiritual expressions of the parables. God is love, and if there is no love, or acceptance of love, then there is only cold and growing distance. This is the cold, dead hell that C.S. Lewis portrays in “The Great Divorce”. Lewis provides a different parable that breaks away from the flames and punishment ideas, and focuses on love and the rejection of love. The consequence of the original sin is being rejected from the Garden, and the presence of God. The result of the sacrifice of Jesus is that the veil of the temple is torn to allow access for all to the holy of holys. Your right. The implications of these parables are based more in relational issues than geographical issues. It’s not about going “up there” or “down there.” It’s more about being WITH God and the righteous, or cast aside with the unrighteous. Relational. Thus the wedding guests that did not come to the party were cast into the “outer darkness.” No mention of fire or screaming. Just being cast out. Matthew 25 does cover “everlasting fire” (verse 41) as well as “outer darkness” (verse 30) and “I do not know you” (verse 12). Perhaps this inspired Dante’s various kinds of hell. Great piece. Very thought-provoking. Something I found interesting in watching a History Channel doc is that much of our current idea of hell actually comes from Dante rather than from the Bible. As some already stated, I think it is more of a state-of-being outside of God’s presence. As CS Lewis said (and I apologize if someone quoted this already), “Heaven is man saying to God, ‘Thy will be done,’ while hell is God saying to man, ‘Thy will be done. '” I think hell is a natural consequence of our rejection of God rather than a punishment for sin. God isn’t going to force us into heaven against our will. 1)	When Adam fell he and his progeny were condemned to toil and trouble, sin and death. No mention of “hell”, but there was the promise that a savior would one day be born. 2)	When Israel was given the law, there were blessings promised for obedience, and curses threatened for disobedience. The curses were things like plagues, drought, defeat by their enemies, loss of the promised land, exile among the nations, being reduced to a small remnant, etc. No mention of a “Hell” but there were promises that one day God would put His spirit in them and put His law in their heart and then they would be obedient and blessed. 3)	There was death and Sheol, which is basically “the grave” and oblivion. But there was also the promise of resurrection and death eventually being abolished. 4)	There was the valley of the Sons of Hinnom which was the place of Judah’s greatest sin and also the place where the full force of the curses of the law would be felt as God said that valley would be filled with the dead corpses of Jerusalem when the Babylonians invaded and took them into captivity. But there were also promises of eventual return and restoration. 5)	The prophets speak often about various nations being judged especially for how they treated Israel(example Joel chapter 3) but there is no mention of a “hell”. And despite the judgments of the nations, there are also the promises that all peoples would eventually be blessed through Abraham and Israel and the coming Messiah. All of these judgments were for the living here on earth. There are no pagan “underworld” judgments in the OT. The dead know nothing and therefore have to be raised to be judged. 1)	Jesus threatens Israel with the judgment of Gehenna if they reject Him and His disciples. In Matthew 23 he tells Israel/Jerusalem that they have a long history of rejecting the prophets and that they are filling full the sins of their fathers(v.32) Snakes! And Sons of snakes! How will you be fleeing from the judging of Gehenna? (v.33) You have always persecuted those whom God has sent to you and on you, this very generation, the full weight and consequences of these sins will fall(v.33-36) Your house will be left desolate until you learn to say “blessed is He Who is coming in the name of the Lord.” Until this time they had cursed and persecuted those who came in the name of the Lord, but at some point in the future the promise is that they will call those who come in the name of the Lord blessed. That generation perished or was taken into captivity in 70AD when the Romans destroyed their nation. That judgement of Gehenna incident was very similar to the judgment of Gehenna in the book of Jeremiah when the Babylonians invaded. In spite of Israel’s long history of judgments, they still have the promise that one day Jerusalem will “light up” and be the light of the nations. 2)	Jesus spoke of an “Outer Darkness”. In Isaiah 60 he says that Jerusalem and Israel will light up and be the light of the earth and shine into the darkness that is over the nations. The “outer darkness” is the nations and Jerusalem is the light. This takes place in the millennium, but it also takes place on the New Earth where the New Jerusalem is the light of the earth and the nations walk by it’s light. Again, this all takes place here on earth to living people, not to the dead or the “living dead”, etc. Again, all of this may be “hell on earth” but it is not the pagan idea of a hell in the underworld. I always enjoy your responses to my posts. You have a working knowledge of Scripture and a clear mind and care deeply about spiritual things. I wish we could sit at a coffee shop and talk through your thoughts on this. I agree that the Church’s simplistic view of heaven and hell and the afterlife are not necessarily biblical, especially in the grand scheme. And there is absolutely a contrast between the Testaments when it comes to discussions of judgment. I grabbed a book out of a box in Jodi and Steve’s old apartment in Sacramento called “At the End of the Ages: The Abolition of Hell” by Bob Evely. It helped me gain a little insight on why someone would think differently about hell without pulling a Rob Bell and putting a postmodern spin on Scripture. Anyway, thanks for such a thorough and thought-provoking response. “At the end of the Ages: The Abolition of Hell” is a nice simple introduction to the topic. It discusses some of the church fathers who believed in universal reconciliation, the words AION and it’s adjective AIONIOS, as well as verses used to support eternal torment and universal reconciliation. When you keep all of the judgment verses in their proper historical context then you can believe the promises as well. For instance, “For even as, in Adam, all are dying” has it’s historical context just as “thus also, in Christ, shall all be vivified. Yet each in their own class…”(1Cor 15:22) has its historical place and time of fulfillment and each truth does not contradict the other.